What is Modified Power Auras? 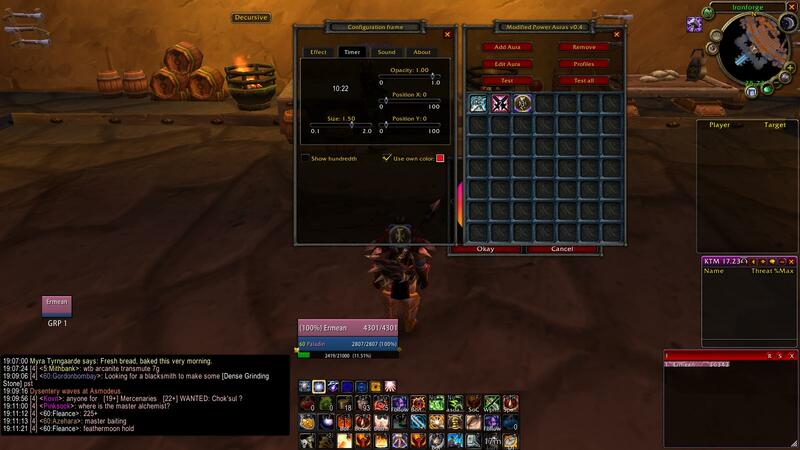 Modified Power Auras is the advanced version of the AddOn Power Auras. It is a lot more powerful and provides every possible function that could be backported from cataclysm. Plus it provides some custom features that are very helpful. What are the advantages of Modified Power Auras? Rename the unziped folder to "ModifiedPowerAuras"
Even greater to see that vanilla addons are still being developed. I managed to produce the following error which happens when I click "Edit Aura" for a buff that I tried to track on friendly target. It happens only when I try to edit that particular aura, and works fine for other auras. Lastly, I have a customized version of POWA as well which I call Power Auras Enhanced which supports tracking buffs/debuffs on any other player (and any number of other players) inside your raid group or party by specifiying the aura name in format "Ermean Blessing of Wisdom" for example. However, since it is based on the usual vanilla version of POWA and is inferior to your version in every other way, maybe you could add those functions to your own so we can have all of it in one addon? Thanks for the report. I will fix this as soon as I'm coming home. This feature could be added in a later version then. Okay I fixed the issues. I decided not to add the feature you mentioned for now, because it will eat a lot of ressources to check after every aura change in the raid for a player, plus iterating through every player to find the right player etc. 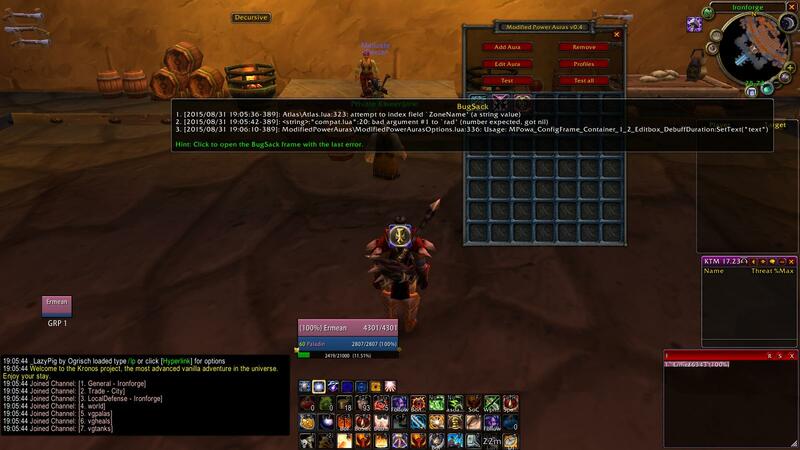 Maybe I will add it someday but for now the AddOn will remain without this feature. I could imagine it being kind of useful though, but I think there are other workarounds. Use people's names as indices for quick lookup in a table when you receive a UNIT_AURA event. Edit: I already wrote a few functions for this feature, till I decided to leave it out for now. The ability to move the icons around on the screen is very limited. It's like a 3x3-inch window at the center of the scren. Is there something im overlooking? When you move it, for example, all the way to left, then you can move it back to center and then move further to the left than last time. It's weird, but it can be done. I haven't checked the addon in game but I can see from the code that it's slower than it should be. You seem to check all auras against all raid members on every UNIT_AURA event. However, UNIT_AURA arg1 gives you the id of the player already (raid1...40 or party1...4) and you don't have to go through the list of players. And then you pretty much instantly have a list of auras that you are tracking for this particular player. After that it's just a matter of going through one single person's buffs and debuffs (with the tooltip scanner - UnitBuff( arg1, i ) and UnitDebuff( arg1, i )) and checking if for i-th buff/debuff it's true that AurasPerPlayer[ playerName ][ i ] == 1. Since number of auras linked to just one player is typically much smaller than total number of all auras you are tracking with the addon, this is also a significant increase in performance. I may have made a syntax error here somewhere since I am just writing this in a browser but I hope you get the idea and how much this would increase the efficiency of the addon. Another nice feature would be, that Consolidated buffs, that are about to runn out (like last 2 minutes of the duration) will be removed from the consolidated window. This way it works on retail. whenever you click "raid only" as a filter, and clicks "never in battlegrounds" it still shows up in bgs. I tried to use this to tell me when i had my cooldown's up. I configured it to an aura icon with a timer. It worked fabulously. I though a good enhancement would be to completely hide the aura icon & timer when the ability being tracked is not on cooldown and able to be used. The addon looks nice, but not having the old auras is a dealbreaker. Including them shouldnt be too hard, think you could add that in a future update?